I'm trying to make living as a cartoonist, which is no easy feat. I knew it would be difficult, but with the help of my wife Tina, we are making some headway. I've also accepted commissions for cartoons. I've received several commissions from Internet personalities and they have been terrific. (They know who they are). They've always paid me right away. Some of my customers have been, let's say, less reliable. 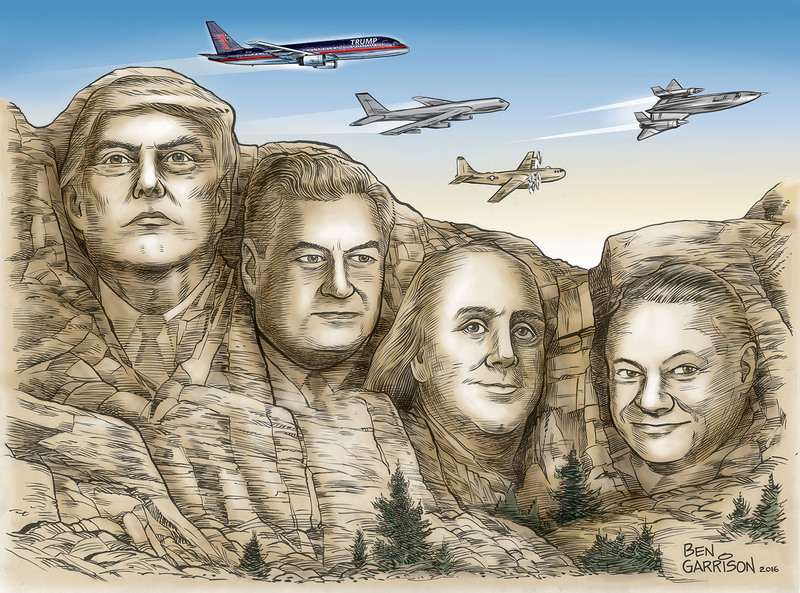 One wanted a cartoon featuring his four favorite heroes on Mount Rushmore. They included Trump, Benjamin Franklin, Curtis LeMay and "Kelly" Johnson. The featured aircraft includes Trump's 757, LeMay's B-52 and B-29 as well as Kelly's SR-71. My commissioner loved the cartoon he requested, but once he got the proof, I was subsequently ignored. All attempts to collect what I was owed failed. I assume he was happy with printing out a low-res copy for his wall. The good news is we still sold the original cartoon at a good price at auction. So someone has a nicely-drawn bona fide, original Ben Garrison cartoon! Many thanks to that buyer. Happy New Year from GrrrGraphics! It's a BIG CLUB. And you ain't in it!